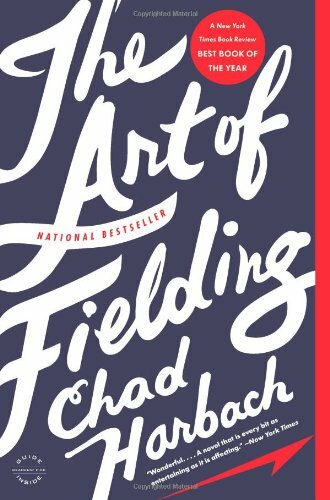 Chad Harbach’s The Art of Fielding arrives on the scene as likely the most hyped literary novel since Jonathan Franzen’s Freedom. Anyone paying attention is familiar with the backstory: the author toils away on it for years, helps found a literary journal (n+1) in the meantime, finally lands an agent, and provokes a frenzied bidding war won by Little, Brown for $650,000. It’s no small relief, then, to say that The Art of Fielding justifies the hype, shaking off any residual weight to deliver a charming, luxurious story that never feels labored. In easily digestible chapters, Mr. Harbach fashions a world as recognizable as our own yet somehow feels out of time (as fables often do), existing in its own heightened reality. It also manages another impressive feat: It’s an unabashed, full-throated baseball novel that stays just general enough to appeal to those with no interest or knowledge of the game. Like The Natural, its most obvious antecedent, The Art of Fielding has everything and nothing to do with baseball, using the national pastime to explore questions of dreams, desires, and how we reconcile the two. As the book opens, we meet Henry Skrimshander, an otherwise nondescript shortstop whose unerring ability to field his position attracts the eye of Mike Schwartz, the captain of the perennially awful Westish College Harpooners. Though Henry might be “a scrawny novelty” who can’t hit, his footwork is so balletic and baseball instincts so pure that Schwartz recruits him to join the team. Henry arrives on the Westish campus with one book: The Art of Fielding, by Hall of Fame shortstop Aparicio Rodriguez, an Ozzie Smith analogue whose book offers advice more existential than instructional (“The true fielder lets the path of the ball become his own path, thereby comprehending the ball and dissipating the self, which is the source of all suffering and poor defense”). Though Henry works tirelessly on all other aspects of his game (it is part of his mystique that he does little else but work on his game), his fielding needs no such work. He begins an assault on Rodriguez’ errorless games record, attracting the eyes of major league scouts and propelling his team up the standings. Mike Schwartz serves as Henry’s mentor, spending countless hours together lifting weights and watching video, putting his own future on the back-burner to get Henry succeed in his. Henry’s dog-eared copy of Fielding pales in comparison to the impressive library of his teammate Owen Dunne, a bench player who introduces himself to Henry as “your gay mulatto roommate” and spends time during games reading. Owen is the source of a growing infatuation for the university’s president and former Melville scholar of great repute, Guert Affenlight. Attending games under the guise of seeing Westish College’s first winning team, Affenlight prefers to sneak looks at the delicate boy in the dugout, and then he receives a pleasant surprise: his estranged daughter Pella has moved back, having left her husband in San Francisco, broke and rudderless. All is well until one afternoon, on the day Henry is poised to tie his idol’s record, he scoops up a routine grounder and overthrows the first baseman, hitting Owen, nose-deep in a book, smack in the head. Through a scoring quirk, Henry is not charged with an error on the play, keeping his streak alive and affording him the opportunity to break it the following game, when Rodriguez will be in the stands to celebrate. At which point he commits another error. And another the next day, and yet another the day after that. All of a sudden, the routine becomes torturous, the failures all-consuming. Eventually he cannot even take the ball out of his glove, sending him into an emotional tailspin. By this point, we have come to assume that Henry is the book’s focal character—it is his peerless fielding, after all, that drives the opening half of the novel, and it is his errant throw into Owen’s face that informs everything that follows. So it’s another deft narrative trick that Mr. Harbach can allow Henry to disappear into his depression for large swaths of the second half, bringing the other four characters and their interpersonal dramas to the fore, without missing a beat. The novel is capacious enough to give Owen, Pella, Affenlight, and Schwartz their space. The question of who then the book belongs to: Is it Schwartz as he takes responsibility for his life rather than managing Henry’s? Or Pella, trying to find herself in the anonymity of a cafeteria kitchen? Or her father Affenlight, choosing whether to indulge in or subvert his basest desires?—becomes moot. It belongs to all of them. If sometimes they come off as better ideas than as fully formed people (Owen, in particular, retains a purity that Henry by the end has long since shed), Mr. Harbach’s big-heartedness toward them more than makes up for it. Vanity Fair published a brief e-book to coincide with the novel’s release that offered a detailed look at the 10-year struggle to get The Art of Fielding published. Besides being a fascinating document for anyone interested in how the sausage gets made, it also revealed that, heavily influenced by David Foster Wallace, Mr. Harbach wrote a zanier and more outwardly “postmodern” first draft in the vein of Infinite Jest. His decision to tamp down the pyrotechnics and let the novel breathe was a prudent one, and this final incarnation now feels indebted less to Wallace than to John Irving, whose A Prayer for Owen Meany looms as a signal influence (that they share Owens involved in freak baseball accidents is the least of it). From the largeness of scope, the tragicomic and soapy plot twists, to both authors’ willingness to engage in sentimentality head-on, The Art of Fielding offers the same relaxed pleasures as the best of Irving, making us feel enriched for the experience.